A profile of Cirrusrealestate.net was found on the social network Facebook. 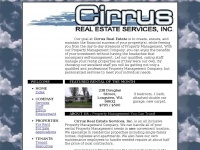 The web server with the IP-address 69.90.46.103 used by Cirrusrealestate.net is owned by Peer 1 Network (USA) and is located in Parksville, Canada. This web server runs a few other websites, mostly in the english language. The websites of Cirrusrealestate.net are served by a Apache server. The markup language of the website is HTML 4.01 Transitional. Due to the robot information on the webpage, the following actions by webcrawlers are not allowed: following the links and archiving the website.